“Is my child too sick to go to school today?” Answering this simple question can leave even the most decisive parents second-guessing themselves nearly every time. On one hand, missing school might mean your child will fall behind and have to play catch-up. Plus, someone’s got to stay home with her. On the other hand, if you send your child to school sick, she may not be able to keep up anyway. And, she could pass her illness along to the rest of her class and come home feeling worse. With so many factors in play, how can you know you’re making the right call? It’s also important to follow school guidelines on when and how long a child should stay home with an illness, she says. Uncertain about which symptoms should sideline your child? Here’s Dr. Ponziani’s advice on judging five common symptoms. “When it comes to vomiting, the decision to keep your child home depends on how he is feeling overall and the reason for vomiting,” Dr. Ponziani says. Vomiting is typically short-lived. But, if your child vomits and is feeling unwell, it’s best to keep him home until 24 hours after vomiting stops. See a doctor if vomiting lasts more than 24 hours, is accompanied by fever of 102 degrees Fahrenheit or higher, or if your child shows signs of dehydration. 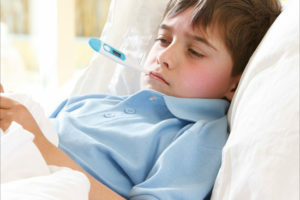 In school-aged children, a fever of 100.4 degrees or higher is a clear sign their body is fighting an illness. Fever often accompanies a contagious illness, so it’s important to keep your child home from school until she is fever-free for at least 24 hours, Dr. Ponziani advises. 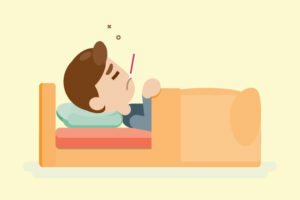 See a doctor if fever lasts more than five days or is 104 degrees or higher. If your child shows mild signs of an upper respiratory virus or cold, such as a cough and/or runny nose, it’s probably fine to send him to school, Dr. Ponziani says. Encourage him to wash his hands often and cover his mouth while coughing or sneezing to help keep germs from spreading. If he also has fever or wheezing, however, it’s best to keep him home from school. See a doctor if you see these more severe symptoms, as they can signal a more serious illness. Assessing a sore throat depends on what’s causing it: It’s probably fine to send your child to school if the cause is allergies or an upper respiratory virus, Dr. Ponziani says. See a doctor if you suspect that strep throat, which comes from a bacterial infection, is causing her sore throat. Other signs of strep include throat redness, fever, headache, stomachache or rash. If your child does have strep, she’ll have to stay home until 24 hours after starting an antibiotic. If your child has diarrhea, the decision to keep him home from school depends on his age and how severe the problem is. Frequent bathroom trips or any accidents should sideline your child until symptoms clear up. See a doctor if diarrhea continues or is accompanied by a fever. If you consider your child’s symptoms and any rules her school has and you’re still struggling to decide, give your pediatrician a call. “We can help you decide,” Dr. Ponziani says.